Interest--and activity--in geothermal energy is heating up, as witnessed by a $40 million Idaho geothermal power plant that will soon begin production. A $40 million investment in a power generation plant using geothermal energy at Raft River, Idaho demonstrates just how interest in the geothermal alternative energy sector is heating up, particularly in the Western United States, where a vast geothermal resource exists. "While the U.S. geothermal industry already has close to 60 projects and over 2,000 megawatts in the pipeline--the development of which will double current capacity--much, much more is possible," says Dan Fleischmann, the author of a detailed report prepared for the Geothermal Energy Association. The report assesses geothermal resource development needs in the Western United States. "There is kind of a renaissance going on now in geothermal," says Daniel Kunz, president and CEO of U.S. Geothermal Inc. U.S. Geothermal is a renewable energy development company focused entirely on the geothermal power generation sector. It is currently developing a multi-phase power project at Raft River and is conducting exploration activities at Neal Hot Springs, Oregon. Interest in geothermal was hot back in the 1980s. A number of major oil companies were involved in exploration activities, driven largely by what Kunz calls a knee-jerk reaction to leap into the alternative energy sector following a string of mini or major oil crises. While geothermal's profile cooled significantly in the 1990s, "we're now in an era of renewed interest." U.S. Geothermal has partnered with the Goldman Sachs Group to construct phase one of its Raft River power project, which consists of a 10 megawatt (MW) monthly average output binary cycle geothermal power plant. The plant is expected to deliver its first power in October 2007, with commercial production in December. The company will transmit power under a power purchase agreement to the Idaho Power Company. It has also recently been named the successful bidder on an expanded, 45.5 MW, sales proposal for Idaho Power for the purchase not only of power generated from Raft River Phase One, but also from a planned phase three development at Raft River, as well as a proposed 26-MW project at Neal Hot Springs. U.S. Geothermal has partnered with the Goldman Sachs Group to build phase one of its Raft River project, which consists of a 10 MW monthly average output geothermal power plant. And contract negotiations are currently underway with a utility in the Pacific Northwest for the output from the 13-MW second phase power plant. These are contingent on additional successful drilling that already has shown a strong indication of the size and potential of the geothermal resource at both Raft River and Neal Hot Springs. The contributing factors leading to renewed interest in geothermal power, says Kunz, are concerns about traditional fossil fuel prices and security of supply, coupled with what he called "good old supply and demand." "The American West is growing at a very significant rate," Kunz says. "Utilities are faced with choices regarding the next big power plant they are going to build. It's a very good time right now to consider moving toward a renewable power source." Geothermal power generation can be competitive with power plants using traditional fossil fuels like coal, says Kunz, when everything that goes into the selection process for power generation is taken into consideration.For example, producers of coal-powered electricity must now deal with issues related to the cost of carbon and mercury emissions, which eventually has an impact on the price of electricity. Federal tax incentives and legislation in many western states demanding that power companies provide a portion of their power supply from renewable energy are also having a positive impact on capital investment. For example, the federal government has recently extended its production tax credit from just the wind energy sector to include all renewable power projects that come on line before the end of 2008. "It's something that helps direct investment toward the renewable sector," says Kunz. "It allows capital spending to come in and enhances returns, thereby making projects far more attractive from an investment standpoint. We have to deal with higher additional capital costs up front, but this tax credit helps to attract investment." Once the facility is paid off, he adds, geothermal power generation plants are very attractive, low cost, low fuel-priced facilities. Another inducement for potential investors is that technology to capture significant value from geothermal energy, particularly formations that are mid-range in temperature, has advanced considerably. The temperature of steam in mid-range formations is typically between 200 and 400 degrees Fahrenheit, and requires the implementation of binary cycle technology. This is a system where the steam from the geothermal formation is circulated through a heat exchanger, which then heats a "working fluid" that boils at a lower temperature than water. In U.S. Geothermal's case, the company is using pentane as the working fluid on the Raft River project because it boils at room temperature. The gas created by heating the pentane is what drives the turbine on the power generator, while the cooled steam from the geothermal source is injected back into the formation where it heats up again and is available to eventually re-circulate through the heat exchanger. That is why geothermal is considered a renewable resource, as a properly managed formation can potentially produce power indefinitely. Ammonia is another working fluid that some other geothermal power developers have adopted. Kunz says U.S. Geothermal looked "long and hard" at the ammonia cycle, but came to the conclusion that it wasn't quite there yet. "Our whole business plan is to minimize risk for our shareholders," says Kunz. "While we have a lot of hope that the ammonia cycle can be a player in geothermal power generation in future, it just wasn't far enough along with a technology provider where we could make it bankable." Geothermal energy for power generation first began to be exploited about 100 years ago in Italy. Technology related to hardware such as generators, turbines, and pumps has advanced so that generating power from this energy source is now more efficient. U.S. Geothermal has contracted the services of Ormat Nevada--a subsidiary of Ormat Technologies Inc.--which specializes in developing the power generating hardware suited for the geothermal industry. It conducted the detailed engineering and design of the Raft River plant, supplied major equipment such as condensers, pumps, a power generator, heat exchangers and turbines, and then constructed the power plant. 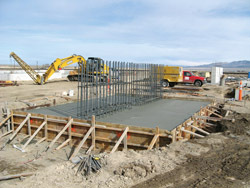 Construction is well underway on the project, which is expected to deliver its first power in October 2007, with commercial production in December. Ormat has designed a custom-made suit for the plant's heat exchanger that takes into account the plant's altitude, ambient temperature outdoors, as well as the temperature and flow rates of the geothermal formation. It is a proprietary system used in combination with the Ormat energy converter. Kunz says Ormat has considerable experience with this type of technology. "Ormat builds the components at their factory in Israel, tests the components there, and then ships them in containers to our site at a relatively low field installation cost," says Kunz. "They can guarantee the output, commission date, and cost of the plant." U.S. Geothermal also hired Industrial Builders of Ontario, Oregon to construct the geothermal pipeline gathering and distribution system, which will connect the production and injection wells with the power plant. Raft River Rural Electrical Co-op is building the production well power distribution lines for delivery of electricity from the power plant to the wellheads. It is also constructing a 3.2-mile power line that will transmit power output from the project's first phase to Idaho Power Company at a nearby substation. 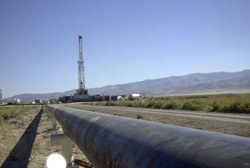 Union Drilling was hired to implement U.S. Geothermal's well improvement program. Many earlier geothermal projects, such as The Geysers dry steam plant in Northern California, depend on higher temperature steam formations to directly provide the energy to drive power generator turbines. This type of formation is called a "dry steam" formation because the steam is released from the pressure of a deep reservoir, through a rock catcher, and then past the power generator turbines. A "flashed steam" plant releases hot water held under pressure in a formation, which flashes into steam once it is released. The steam drives the power generator turbine before being returned to the formation. While dry and flash steam formations are easier to access, they are fewer in number than mid-range formations. What has investors excited about the Raft River project is that the geothermal formation may be as large as predicted by formation modeling. In the 1980s, the Department of Energy drilled five production wells and two injection wells on the site. All five production wells hit quality geothermal fluid. At that time, the department drilled two injection wells to a depth just above the production zone. U.S. Geothermal recently drilled these wells into the production zone and encountered producing fluid, turning these injection wells into production wells. "It's similar to operating a gold mine and finding gold ore underneath your waste dump," says Kunz. "What we are now doing is putting our injection wells further out." 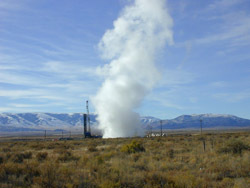 On the basis of a report prepared by the company's independent consultant, GeothermEx Inc., the site is believed to have a 50 percent probability of a power production capacity of 15.6 MWs per square mile, which may translate to 100 MWs or more, based on U.S. Geothermal's current ownership and lease holdings in the area.